Hoosiers rise to No. 12, but should they be higher? Fresh off a 74-70 win over No. 2 Ohio State on Saturday night in Assembly Hall, Indiana received a bump in both the Associated Press and USA Today/ESPN coaches’ Top 25 Polls. Despite a loss earlier in the week at Michigan State, Indiana jumped up one spot to No. 12 in the AP Poll and climbed three spots to No. 12 in the coaches’ poll. But even with the upward movement for the Hoosiers in both polls, there’s still one team ahead of IU that’s drawing some controversy from the national media: Louisville. And this is why the polls are the polls: At this point, of course Indiana deserves to be ranked higher. The Hoosiers are 13-1 with a win over Kentucky and a win over Ohio State; few teams outside of UNLV can boast one win of that quality, let alone two. Indiana’s only loss came on the road at now-No. 11 Michigan State. Contrast that with Louisville, whose best win is probably a 62-60 overtime victory over a then-struggling Vanderbilt team. The Cardinals lost twice last week, and while the Kentucky loss was actually somewhat impressive — the Cardinals hung tough on the road with a much more talented team — the disappointing home performance to Georgetown early in the week raised appropriate questions about this team’s true quality. If you’re willing to use per-possession statistics as even a general sign of ability — and why wouldn’t you be? 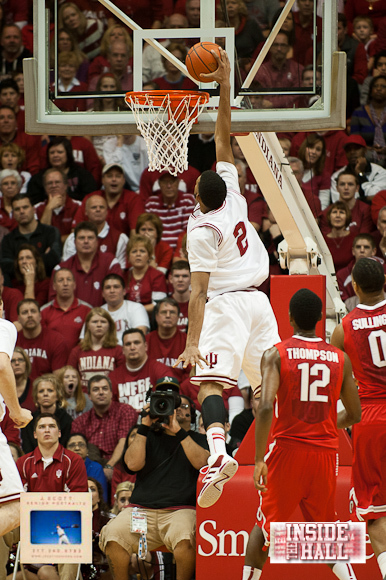 — Indiana’s numbers rank them among the best seven or eight teams in the nation. As of Monday, Louisville is ranked No. 17. The only loss is a loss at Michigan State, and Indiana actually led that game with less than nine minutes remaining. (Michigan State, by the way, is 13-2 with losses only to North Carolina and Duke. So, like I said, IU’s loss at Michigan State is not a bad loss.) Meantime, the Hoosiers have wins over Kentucky, Ohio State and Butler. That’s really good at this point in the season and why I can’t understand the coaches ranking IU 12th. Let’s compare the Hoosiers’ body of work to one team ranked ahead of them — Louisville. The Cards are 12-2. They have zero wins over teams currently ranked. They have a loss to the Kentucky team that IU has already topped. And, if you’re into this sort of thing, the Cards are nine spots behind Indiana at KenPom.com. So how is Louisville ranked ahead of Indiana? And why is Indiana still outside of the top 10? If the Hoosiers are fraudelant, we’ll find out soon enough and adjust accordingly. But for now, they probably belong in the top 10, and they definitely belong ahead of Louisville. This is, of course, something that happens every season in college hoops and football thanks to preseason rankings. The Hoosiers were off the radar when the season started and only received a spot in the top 25 poll after knocking off Kentucky, which was fair. Louisville, meanwhile, was a preseason top 10 team and reached No. 4 after winning 12 straight games to start the season. At some point, however, those casting a ballot must replace their preseason prognostications with reality. No, Indiana has not proven it can win on the road in the Big Ten, but the Hoosiers did win at Evansville and N.C. State. Survey the teams in front of IU in the polls and only Baylor, Georgetown and Syracuse can also boast two wins in true road games. And no team has a pair of better wins in Kentucky and Ohio State. In the end, polls in college basketball are rendered meaningless when Selection Sunday rolls around. But for now, they’re a fair topic for debate and discussion every Monday afternoon. Thank you. I just wasn’t saying it well apparently. The cost of success is high. This just in, many coaches didn’t like Knight either. This is quite funny actually. These guys do a great job of doing exactly the opposite. If you read through the blog over the years ITH borders on the “cautiously optimistic” side more than anything. IU has knocked off 2 Final Four contenders. Mich St has lost to 2 Final Four contenders. Put them in Assembly Hall right now without the calls and they are going down. Easy on our ITH crew 0512. These are happy happy times again. And you can add tendons, ligaments and bones to your list of blood, sweat and tears. Being there at the end is all the matters. We have captured the attention of recruits. If we keep winning then all things fall into place. I don’t care about rankings, or that much about seeding. The only thing it possibly helps is recruiting, but top 10 top 20 doesn’t make much difference. That said, the sportswriters and selection committee get it so wrong sometimes. Think of Butler’s poor first round opponent last year playing a supposed 8/9 seed. That team, can’t remember the name – Virginia school, was really tough. Maybe they would have been better off with a 10, 11, 12 or even 13. Or IU playing Cleveland state or Richmond 20 some years ago as a high seed. Getting a “good” seed doesn’t mean squat, except for a little respect. But that all goes out the window once you play the games. Ask VCU! Or ask George Mason’s opponents? All the rankings/seedings really do is determine if a win is called an upset, even if it never was. I understood you from the get go Milla. Indiana Alumni, boosters, fans, students, athletes, employees, and fans know how the majority of the nation perceives us as a threat. I made a point similar to this earlier but not as much into detail. Does anyone actually think that other coaches that are competing (with Indiana) to garner high level recruits are going to vote for Indiana which would be to propel Indiana further into the spotlight? This in effect gives Indiana momentum and an even wider margin of assets to obtain the best basketball talent. It is all a game, and Indiana will always face the handicap of hate because it truly is among the royalty of basketball. Indiana has a basketball purity that very few other schools can comprehend, let alone boast. It’s Indiana, and all competing coaches realize what that statement means. All coaches are highly highly competitive and that does not stop on the court. Competition now begins to reign in the best talent just to be able to compete on the court. If it means competing in the polls then the games will be played there as well. If more coaches rankings are discussed openly each week then there will be a level of accountability, but it is very hard to police this. We need to “just win” and all will be fine. “It’s Indiana.” I am proud to be a Hoosier and to be able to boast that. I grew up in the 50’s watching IU basketball with my dad on a very small round B&W tv. They even had a magnifying glass you could buy to make the players look bigger. I can tell you one thing hoosiers where excited as much about IU basketball back then as they are now. I started at IU the year before BK came to coach. We were terrible. Was Lew Watsons last year. Kinda like the last 3 years for IU. BK took the same guys (that stayed) and made them into contenders in a very short time. I can tell you that BK would have cut the rankings out and pasted them on the locker room wall to motivate the players. Another coach named John Wooden whom I have grown to respect very highly would not put the rankings on the wall or even pay attention to them. He wouldn’t evan pay attention to the next team UCLA was playing. He felt that you would spend the time to make each player better in practice and the outcome would take care of itself. He would say that the type of motivation we are seeing here is very very short lived. What happens when we do go up in rankings? He would say that just the privledge of wearing those candy stripes should be motivation enough. He said the only motivation he used was the bench. He spent his time helping each player get better and not worrying about polls or rankings. It’s kinda like his saying of “Don’t let yesterday take up too much of today.” Our guys should spend time worrying over rankings but about how they are going to get open the next game or how to better guard someone on defense. Not to stay out partying past midnight with a boot on or not. did anyone really think we would be 13-1?? im going to enjoy the ride this year. lets stay healthy after will gets back and make a deep run in the dance! GO HOOSIERS! WE ARE ALL FOR YOU!! Also don’t forget the added aspect of the fact that the state is usually one of the most fertile recruiting grounds in the country and is seeing a sort of a renaissance of quality players that is coinciding with IU’s return to prominence. Yep. I went 10-3 and 10-8 in conference and I thought my head was in the clouds (so did a lot of us). This season has far exceeded fan expectations. Even more interesting was that most people agreed the B1G would be down this year. But now it’s the best conference in the nation. Go figure! Short of complete insanity and lack of objectivity, few people thought IU could win 24 or 25 games, but now that seems possible. Even more amazing is to think that with a good run in the B1G tourney, NCAA tourney, and continued success this season, IU could actually win as many or more games (28) than Crean had in his first 3 seasons. I said I would of been satisfied with 18 wins. Correct. I thought about that after because I knew that’s where they beat Harvard, but didn’t bother to correct it cause I’m lazy. I think IU has arguments to be ranked higher than Louisville, UConn and GTWN. I agree. I wish I had tickets to senior night this year so I could give them a standing, screaming, hollering ovation from the time I got there until the game ends! They deserve it. They stuck it out and look how their hard work has paid off. They definitely deserve a lot of the credit! I just haven’t been impressed with PUke but I watched Michigan the other day and they looked good. They have a lot of shooters. They actually remind me a bit of IU, except they have a stud freshman PG and we have a stud freshman PF! yes, getting a top 4 seed is important…there are 3 close 1st and 2nd round sites…Louisville, Nashville and Columbus. getting sent to Louisville would be sweet. I like them ranked right where they are right now. I don’t want them higher until they win a couple of B10 road games…..I like the idea of them growing into their ranking a little bit and slowly moving up over the course of the season. I want them to have some time to assimilate their new found success without getting so far into the limelight that they get blinded. I understand why some pollsters are hesitant to rank us higher, they are not yet convinced the Hoosiers have legitimately joined the ranks of the top ranked teams. But beating the #1 and #2 team in the country in the same month? What more do they want? And if Sullinger was able to play at Kansas perhaps we would have beaten two #1 teams in the same month. Yet how important are the polls other than for seeding for the tournament – only for egos. I guess that is why Bob Knight never bothered to send in his poll. Who cares what they think. Let’s just keep on winning. New Year’s Eve, Frank, New Year’s Eve. Holiday the next day. Timsterd reported seeing him walking down Walnut shortly after midnight. You’re adding the partying assumption on your own. And if you think players on Bob Knight’s team weren’t out “partying” after midnight on game nights, you’re mistaken. And because UCONN just lost again. BTW, Harvard (#21) just lost also…so it’s making that victory look less impressive. We’ll get the respect someday…but until then, let’s just let the yayhoo hillbilly UK fan with herpes rip on our team for being “not that good” and see where the chips fall. greed is one of the seven deadly sins..i think our team exudes humility (the opposite of a deadly sin) and the best way to handle the disrespect is to win. Wouldn’t it be sand in the undershorts of all the haters if (and i know this sounds dellusional) the pull a Butler and go to the final game this year…but then win it all next year? Elston hasn’t hit any outside jumpers since all the cupcakes got eaten. Has picked up some trash rebound put-backs which were very important againstUK and OSU. Still better than TP’s no threat to score form anywhere issues. I’ve continued to be a true IU fan through all the termoil since the fireing of coach Knight, listening to friends tell me IU will never get back on top. It’s been a long road but I knew in my heart this day would arrive. I don’t care about polls or ESPN comintators, I’m happy to be ranked #12 and not have a target on the teams back that you would have with a #1 ranking. This coach and players have achived so much in a relatively short period of time, and there is more success to come. GO IU! He said IU alumni KNOW that CTC is not well liked by NON-IU people, especially coaches.